​Learn practical ways to reduce stress and discover your path to personal success! Hypnotherapy offers techniques you can use in your daily life that can promote mindfulness and a greater sense of purpose. Join us for a talk and group relaxation/visualization exercise that will help leave any stress and worry of the day behind to better focus on manifesting your dreams for the future. Get in gear for the brand new year! ​​Want to lose weight? Learn techniques you can use to change your patterns of thought, feeling and behavior so they work for you, rather than against you. Discover and Be Your Ideal Weight. No matter what diet or nutritional plan you follow, the right mindset makes all the difference when it comes to maintaining a healthy weight. ​Want to lose weight? Learn techniques you can use to change your patterns of thought, feeling and behavior so they work for you, rather than against you. Discover and Be Your Ideal Weight. No matter what diet or nutritional plan you follow, the right mindset makes all the difference when it comes to maintaining a healthy weight. 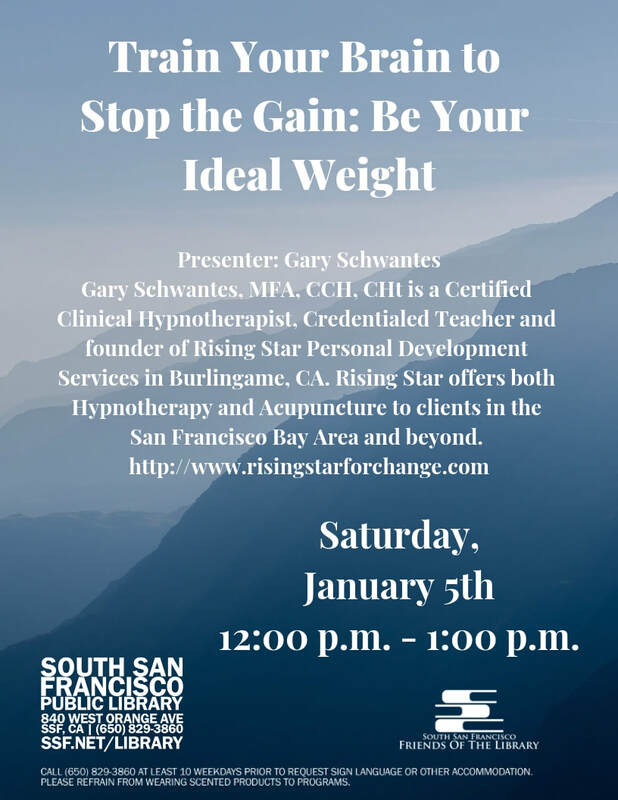 Gary will be doing a presentation for the SF Hypnosis & NLP Practice Group in April. This meetup is oriented towards Hypnosis practitioners, but interested members of the general public are also welcome. Event is at the SF Main Library. RSVP through Meetup. Join us! Gary Schwantes, Certified Clinical Hypnotherapist presents an interactive introduction to Hypnotherapy. Through group relaxation/focus/visualization exercises, participants will experience the concepts directly and have the opportunity to apply them to a personal goal or issue. Free admission. 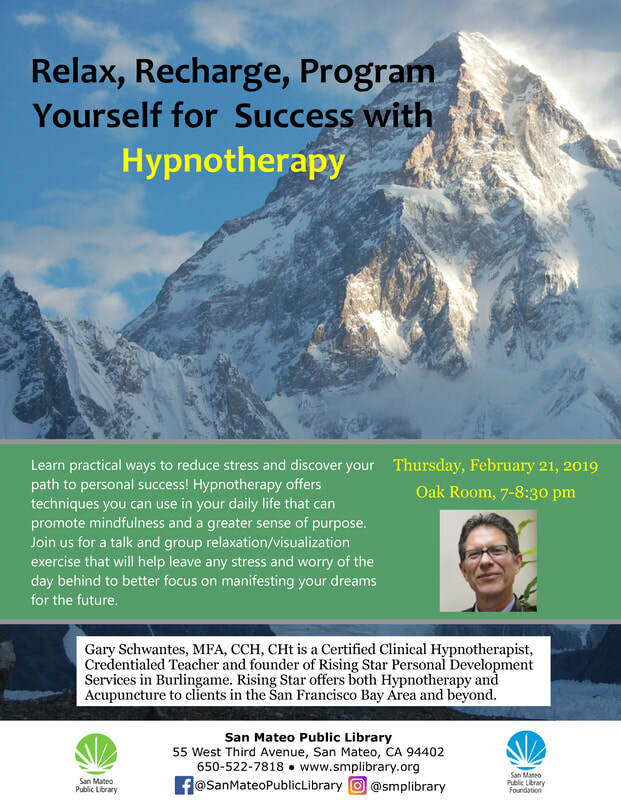 On Wed. March 29, 2017 at 6pm, Certified Clinical Hypnotherapist Gary Schwantes will be giving a Free presentation at the Millbrae library called "Hypnotherapy: Harnessing the Power of the Subconscious." It'll be an interactive presentation with plenty of useful information as well as powerful group exercises which can be applied to any area you wish to improve. See you there!